Here is something different from cards & paper crafting. For the Artsy Craftsy Mom Sep challenge- Ganesha, i wanted to do a quilled Ganesha, but i dint get adequate time. So sharing with you all a Ganesha painting i did a really long time ago. I attended a Tanjore painting class long back before marriage. You all know Tanjore painting materials are very costly including the Gold foil, stones ets. I followed the same steps except dat i used wat i had at home. 6. Stick the stones, i used the ordinary stones available at local stores, not the kundan ones. 7. Next use a mehandi like cone and fill the same mixture and do all the detailing on the frame & jewels. 8. Now comes the painting part, used acrylic paint for this. Am not very good at painting, but i loved my Ganesha very much since it was full n full my own effort. Also this is very easy for anyone who is even okay at painting. Do share ur comments on how do u think this is. The Ganesha so cute..Sujana.. Your paintings is so good..the fingers are very nicely painted..Same pinch i too have done one tanjore painting - Ganesha and that too before my marriage..
Its wonderful Sujana ..I love tanjore painting for the rich look they have..ya they are costly!! Its amazing how you have come up with you own materials to make such fab painting !! wow sujana...loved ur painting....liked d way u made it all by using honebased proucts.....brilliant n fab job. 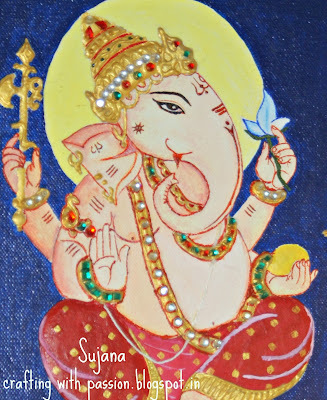 So beautiful sujana..love the colouring of ganesh . awesome piece ..